But then there's the really strange stuff – the powers that push the limits of imagination itself. Weird Science. Eleven structured styles of mad and fringe science – ranging from early psychical research and Frankensteinian experimentation to sci-fi nanotech and para-energetics – let you invent unlikely technologies, explore impossible realms, and tinker with the nature of life itself. What could go wrong? 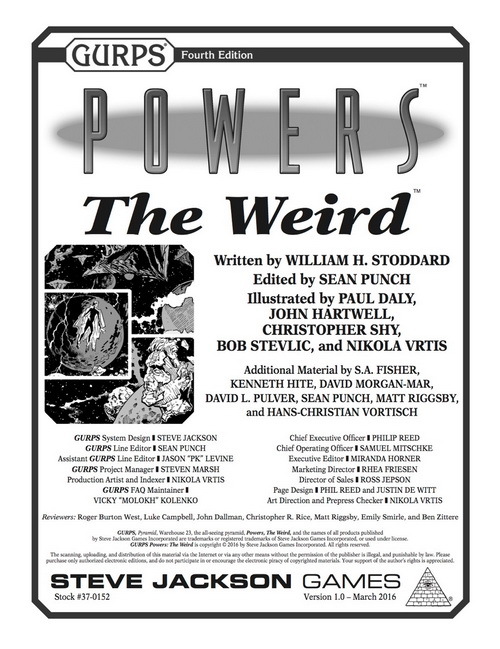 For the nuts-and-bolts of weird abilities, you need GURPS Powers. 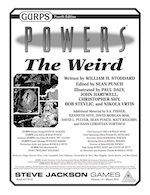 Make the most of The Weird with the edges found in the pages of GURPS Power-Ups 2: Perks. The Weird is great to explore the strange corners of a meta-human universe you've built with GURPS Supers. For a version of mad science that functions like magic, check out "Sufficiently Deranged" from Pyramid #3/122: All Good Things.